You can make big savings on drive-up parking fees when you book your parking online. The earlier you book ahead, the more you can save! Each additional 24 hour period or part thereof is $62.00. Height restrictions for these carparks is 2.1 metres. The bridge link between P1 and P2 is 1.98 metres. Each additional 24 hour period or part thereof is $51.00. Height restrictions for this carpark is 2.3 metres. Height restrictions for this carpark is 2.2 meters. Height restrictions for this carpark is 3.5 meters. Drop off your car and head straight to the gate with Pronto Valet, for just an extra $26.00. Being only steps away from T2 and T3 Departures, it couldn’t be easier! Location Level 3 of the Domestic multi-storey car park. Access via Entry Gate on the Departures level. Hours of operation 5am–11.30pm weekdays, 5.30am–11.30pm weekends and public holidays. Rates Each additional 24-hour period or part thereof is $64.00. Step off the plane and take off in your sparkling clean car! Check out our valet car wash services. 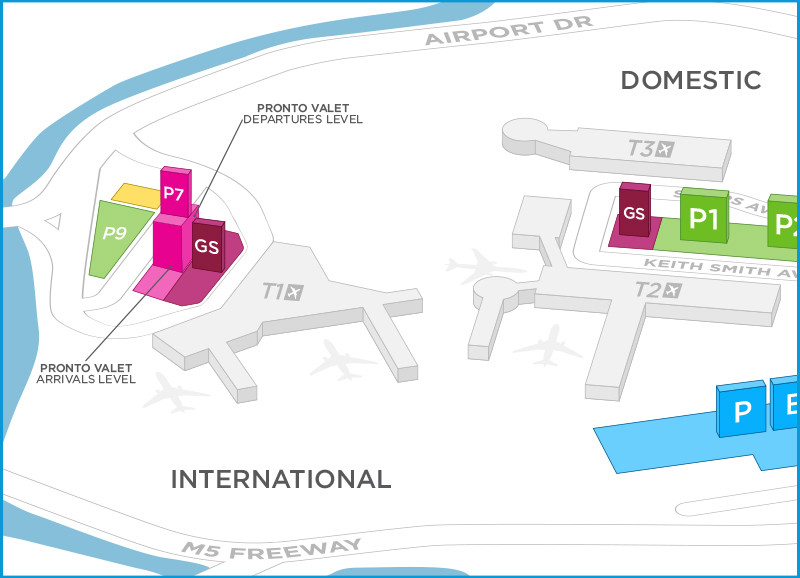 T2 Valet offers fast direct access to the T2 check-in counters and is available to all Domestic travellers. Simply drop your car off and it will be ready waiting for you at the Pronto Valet location on your return. Location Departures Road, at the beginning of the T2 Domestic terminal. Hours of operation 5am–11pm every day including public holidays. Drop off your car and walk straight into the Virgin Australia Lounge at T2. 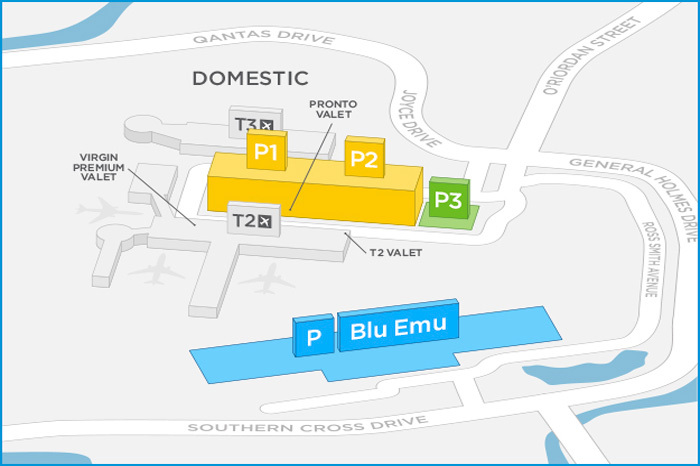 Premium Valet is for the exclusive use of Velocity Frequent Flyer Platinum and Gold members, plus Virgin Australia business class guests. Location Departures Road, at the far end of the T2 Domestic terminal. Hours of operation 5am–9.30pm every day including public holidays. On the same level as International Arrivals, it’s just a few steps away when you're picking up family and friends. Location This Pronto Valet service is located on ground floor of the P7 multi-storey car park right next to T1 International. Follow the ‘P’ signs to car park from either Marsh Street, Qantas Drive or Cooks River Drive. On arrival, get a ticket at the entry gate or validate your online booking by scanning the QR code on your Booking Confirmation email. Proceed to the entrance of the P7 multi-storey car park and drive into the Pronto Valet driveway, where a Valet attendant will greet you. Hours of operation 5am-11pm every day, including public holidays. Standard rates Each additional 24-hour period or part thereof is $64.00. Location As you drive into the T1 International area, follow the signs to Departures. As you go up the ramp and around you will see the Pronto Valet entry on the right hand side of Departures Road.